Fans visiting Cologne's official website on Friday may have had to look twice after seeing the word 'Europe' appear in the top right-hand corner. Heading into the final weekend of the season, the Billy Goats need to beat Mainz and hope that Freiburg fail to win at Bayern Munich to rise to sixth and book a place in the Europa League next season. Have Cologne's media team jumped the gun, perhaps? On closer inspection, the tab is not, in fact, an overzealous addition, but rather a message to the Bundesliga club's fans. 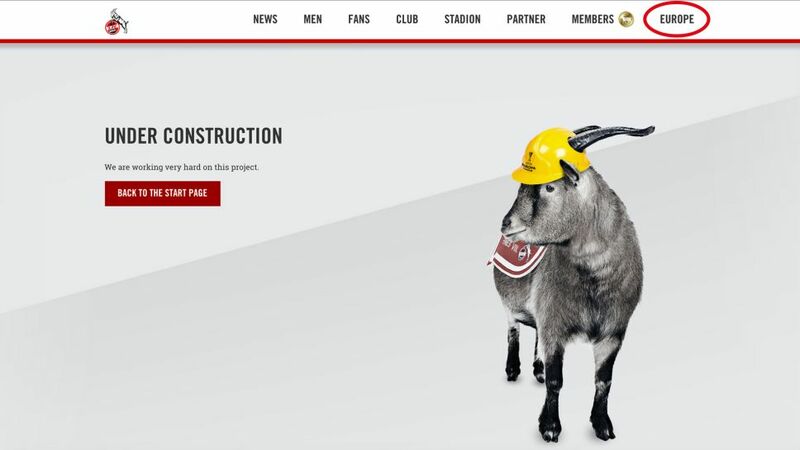 Indeed, if you click on 'Europe' you are taken to a page 'under construction', with the statement: 'we are working really hard on this project' next to a picture of the club's mascot wearing a Europa League hard hat. It is hardly surprising that such a light-hearted touch comes from a club based in a city famed for its Carnival, and one preparing for celebrations to be sparked once again this weekend. Click here for more Cologne news.